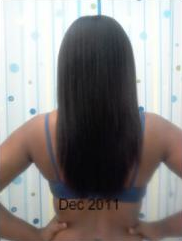 For 2010-2011 relaxed/texlaxed and natural features, check this post. I am relaxed and as of Dec 2011, I am/was MBL. Haven’t done a length check since. 2) What mistakes have you made in your hair care journey? I wouldn’t call them mistakes but more like a learning process. LOL. When I first started I followed everybody else’s regimen instead of simply listening to my hair. I was using cheapie conditioners because I heard everyone say ‘all conditioners are made equal’. That is a pure lie. LOL The first 10 months of my hair journey was at a standstill. I didn’t retain a thing. 3) What is your current HEALTHY HAIR routine? I currently wash my scalp every week. I deep condition for more than an hour. At every wash I do a protein/moisture treatment. I currently only use Nexxus products. I keep my regiment very, very simple. The less manipulation – the better. 4) Do you have a HEALTHY BODY routine? If so, what is it? I only recently started ‘clean’ eating. I never did that before in my life but I started noticing my curves were becoming more…… curvaceous. LOL I had to make a quick change. So far, I love it and I see the difference the most in my overall skin. 5) Do you have any advice for those seeking healthy tresses? In the beginning you’re going to expect major change and may get frustrated if you don’t see any. You’ll even have people telling you that your hair can’t grow or won’t grow pass a certain length. Have patience and stick to what works for you. Eventually, you’ll see a major difference and your hair will thank you. Many people don’t like to protective style, I suggest they start. I love your hair and you inspire me. Keep up the good work!!!!!! !